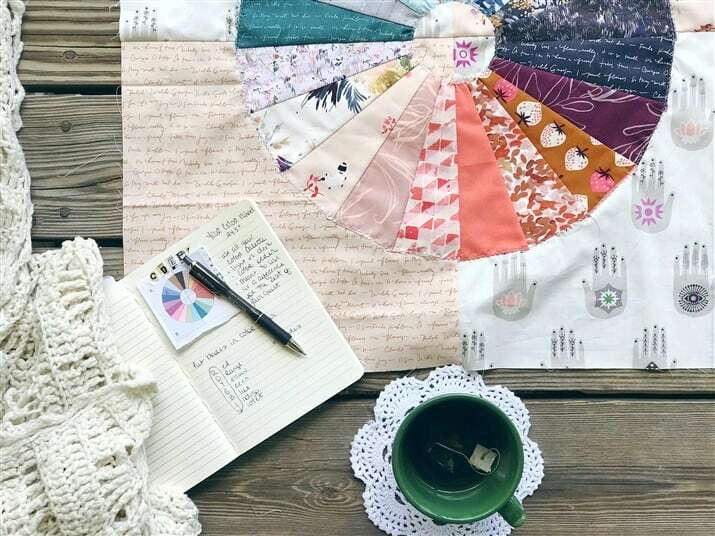 Professional quilters, mixed media artists and sewists, provide tips and techniques to help you create your own unique fabric arts. This post is a part of the I am Enough quilt along that starts September 28, 2018 and ends February 1, 2019. 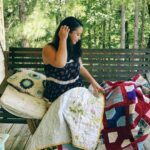 If this is the first time you are learning about this quilt along then please read this post to find out the intentions behind the quilt along and more details. To view all the posts concerning this quilt along, click here. To view the email archives of this quilt along, click here. Picture me jumping up and down and clapping. That’s how excited I am to FINALLY begin on this quilt. It’s been on my mind since last May and since we announced the quilt along this past June, many of you have reached out and told me how much you love the theme and the intentions of the I am Enough quilt. Your words have meant so much to me. Apparently, not thinking we are enough is a running theme amongst most of us. Let’s banish this thinking. I’m so tired from it. I am average at everything in my life, and most of you are probably just like that too. What could possibly be wrong with that? Why do I need to change this or that? Just because Mia is really good at decorating her house doesn’t mean I have to be or that I’m awful at it. Just because Karen puts together the BEST color palettes doesn’t mean mine are ugly. We all have our strengths and our flaws and they are all different from each other and they are all fine. I am enough just as I am. YOU are enough just as you are. I am enough with floors that aren’t as clean as they could be. I am enough with my double chin. I am enough when I ate a larger piece of chocolate cake than I should have. I am enough even when I didn’t get all of my to-do list checked off. Recite all of this to yourself inserting your own personal issues and let it sink in. Now when you begin this quilt, whatever fabric/design/creative choices you make for yourself OWN them. This quilt is about what YOU like, not this other girlie or guy. Just you. The colors and designs that you prefer can never be wrong. We are going to be making the YOUR Color Wheel today. Before we get to it let’s get a few color lessons out of the way. If you are a pro at color, please feel free to skip the lesson, if not let’s learn some color basics. We are not going to get massively in depth with color order and the why and how. I just want you to know that it exists and it can be cool. Lots of you are into rainbow quilts. I like to look at them, but I’ve never made one. Just because their appeal is not so strong with me, doesn’t mean I can’t use the color order to make something I like or that better suits my own taste. Notice that the pieces I chose for my color wheel in the picture above aren’t exactly rainbow. Even so, they are still in color order (as best as I could do) and I LOVE the look of them. Do your own thing with YOUR Color Wheel if you’d like, or put it in color order to help yourself learn this little color lesson a little better. As quilt makers, sometimes we want things to blend and sometimes we want them to pop. I like both! Though sometimes I will have exceptions to my rule to make things more quirky, I also like to go into each quilt with the thought of what is my background fabric and what is my focal fabric. For this block and the majority of my quilt, I’ll be using scrappy low volume as my background and my color palette as my focal prints. The low volume is the light and my color prints are my dark. This means my color wheel will pop off the background. The reason we are starting with this block is so that it will be a reference for the rest of your quilt to help you remember your chosen colors. Decide on a color palette. Use at least one of every color from your chosen color palette in YOUR Color Wheel. For example, the above picture of my color wheel shows you what my color palette is. Though the shades and fabrics will vary, you will only see me using these colors for the rest of my quilt. In the pattern and video tutorial I am using, Charlotte’s Fusible Web as my applique method. It is a new to me product. It takes the place of interfacing or adhesive when working on raw edge applique. The major benefit I have found is that it takes away the bulk or stiffness caused by those materials. When using Charlottes’ Fusible Web you simply have two fabrics on top of each other, no bulk. Click the tab below to download the pattern and get started. I cannot wait to see what you make! If you are only interested in the Charlotte’s Web part of this tutorial, it starts at minute 7:30. Click here if the video does not load properly. If you’ve never cut a blade before, here’s a tutorial for that. But note, you are cutting 6.5″ blades. If you are cutting from scraps or small pieces, cut it to 3×6.5″. After that you only need to cut the sides. Make sure you line up the top and bottom of the blades as you sew them together. Unlike with Dresden plates, our color wheel will show when they don’t meet up. If you don’t like the applique method I’m using in the video, here’s another, and another. In the video, I mention chain piecing. Here’s what that is if you’ve never heard of it. I like to use a method that I call Controlled Scrappy. 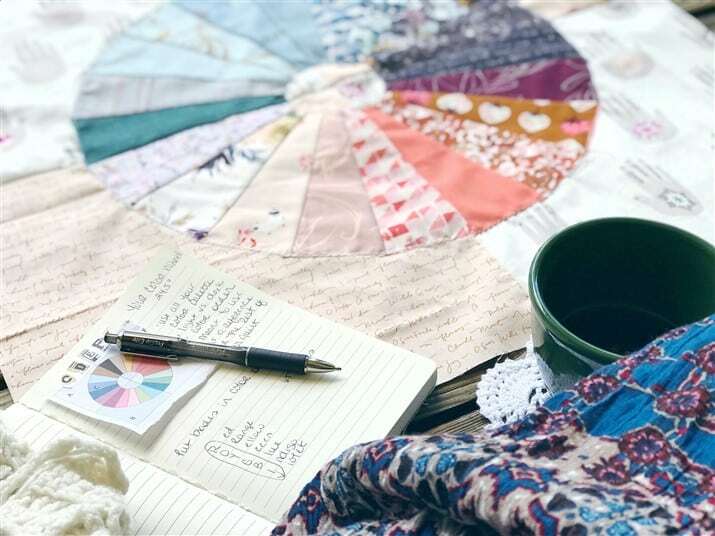 What I mean by that is that when I’m making a quilt, I start with a color palette regardless of whether I’m making a scrappy quilt or just shopping my stash. This can be a tight color palette (a few colors) or a broad one (many colors). 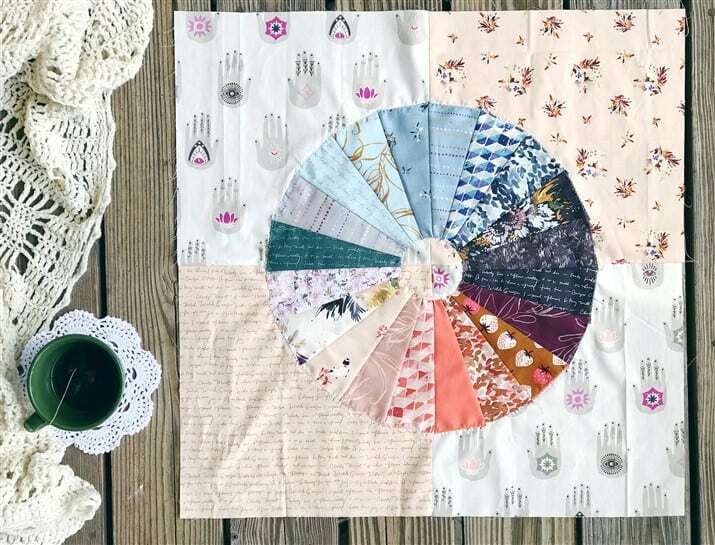 You can get a color palette using your own preferences, something you seen in colors you like or by starting with a fabric collection and just adding in fabrics that blend well. If you’ve given scrappy a try before and didn’t like it, maybe it was because you used any and all fabrics instead of sticking to a color palette. Try controlling the scraps you use and you might like the scrappy look even more. 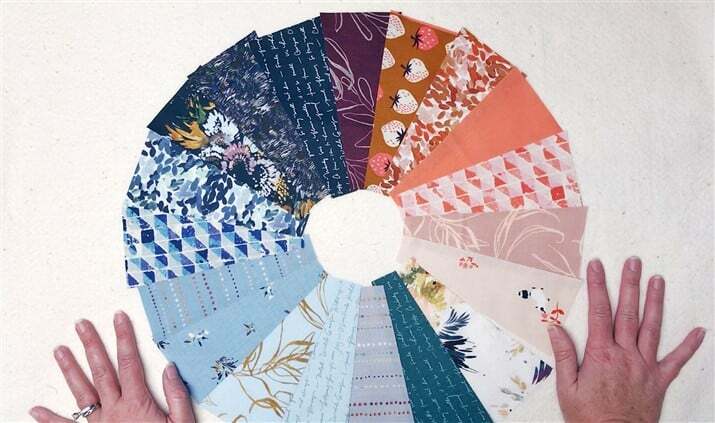 Here’s a more in depth look at choosing fabrics. When I can’t decide on color palettes I take it to Pinterest. In the search bar, type in something like: color palettes with turquoise. This is a great tool when feeling a bit undecided or uninspired. Visit my color board here. 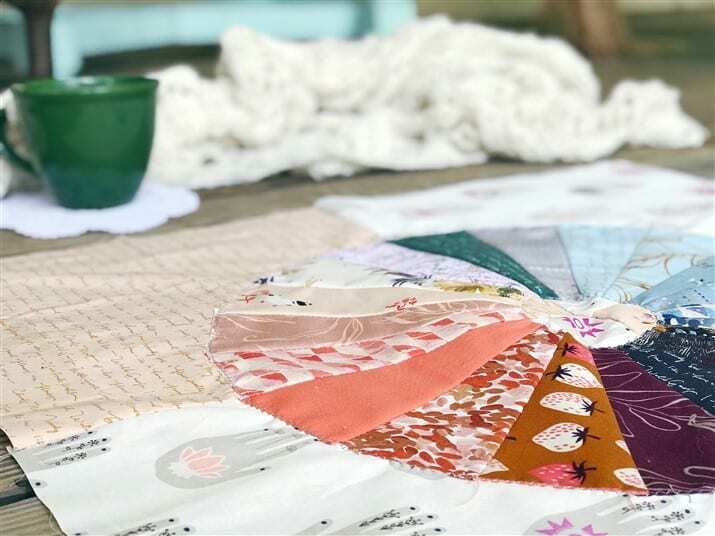 Be sure to post your progress on YOUR Color Wheel block on Instagram to be eligible for the bi-weekly prize from Havel’s Sewing. Havel’s will announce the winner on Instagram on the Thursday before the next pattern releases. 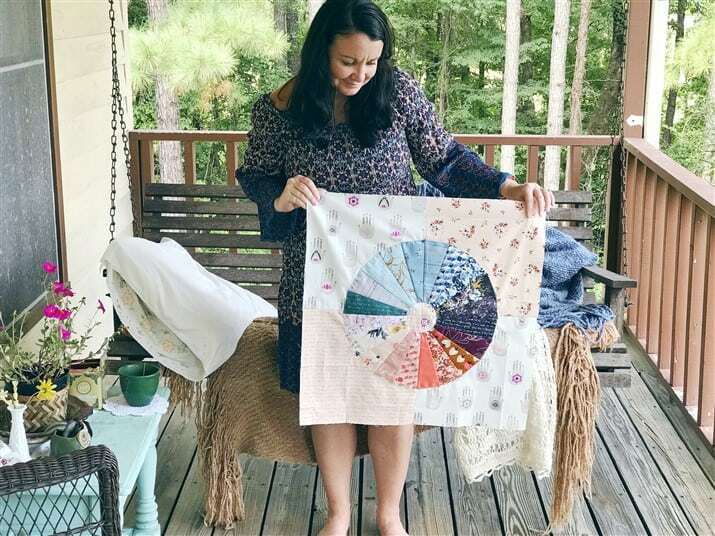 Use the #IamEnoughQuiltAlong on a progress pic of YOUR Color Wheel. Follow @Havels_Sewing and tag them in the post. Follow @SouthernCharmQuilts and tag me in the post. If your account is set to private, you will not be entered. Prizes open to US residents only. I’m thrilled that you are here! I want you to enjoy yourself and make new friends. If you need any help or have questions, please don’t hesitate to reach out. This entry was posted in art ideas, Fabric, Fabric Rotary Cutters, Fabric Scissors, Fabric Selection, Free Craft Projects, Free Quilt Patterns, Free Quilt Projects, Free Sewing Project, How to Make a Quilt, Melanie Traylor, Patterns, Quilting, Quilting, Quilting & Embroidery, Quilting Tools, Select Fabric, Tutorials and tagged crafting, i am enough quilt along, making, quilt alongs, Quilting, Sewing. Bookmark the permalink.